A steady and happy trend is presenting itself in the Irish industry at the moment, our emerging talent fast on its heels, and that is the quantity of writers and directors moving from shorts to debut features. Lee Cronin is a great example, with a strong slate of tense shorts behind him, one of these the award-winning ‘Ghost Train’. Bankside Films acquired the rights to his upcoming debut ‘The Hole in the Ground’ last month, and has already cast ‘A Date For Mad Mary’ star Seána Kerslake in the leading role, with Conor Barry and John Keville of Savage Productions producing. Executive producers are Phil Hunt and Compton Ross of Head Gear Films and Hilary Davis and Stephen Kelliher of Bankside Films. The Irish Film Board meanwhile, granted €12,450 in development funding followed by a provisional offer of commitment for production funding this year. Cronin talks us through this development process, his earliest work in the industry and what makes him tick as and up-and-coming Irish director. IFTN: Can you talk us through your background and how you came to be a filmmaker? “There’s the guts of a decade between myself and my older siblings, so I was exposed at a young age to films I probably wasn’t quite ready to see. I had ‘The Shining’ and ‘A Nightmare on Elm Street’ under my belt before I was ten years old. I was terrified, but drawn to them in equal measure. The first movie I remember seeing was ‘Jaws’, and the moment Ben Gardner’s head pops out of the sunken boat hull is burnt into my brain. IFTN: It's important to note that you are not only a director but a writer; where do you feel you draw your inspiration for your stories? “I wish I had the answer to that question as then it would be easy to just reach into that place and find another story to tell. That’s the real challenge, finding a story you want to tell. Something you are willing to live with for a huge chunk of your life. I think inspiration is more often a reaction for me. A feeling I get to something that you think, hear or see. 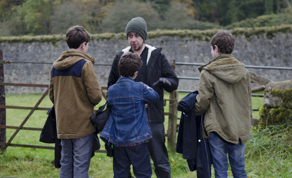 IFTN: It's fair to say looking at your previous shorts you favour dark topics and themes. Who are the filmmakers in the horror and thriller genres who most influenced you? “It’s a very fair thing to say indeed, but I like to paint the darker topics with some streaks of light in there too. I love John Hughes movies, so I always think there’s space for a subtle gag in even the darkest of stories. It’s cliche to mention Spielberg as a huge influence, but it’s true. I hoovered up the Amblin world and all it influenced when I was growing up. The same with Kubrick. IFTN: It must be a great vote of confidence to have Savage Productions behind you when you see how well ‘Pilgrimage’ is doing on the festival circuit and with distributors these last few months? “The team at Savage have had their shoulder behind this film since the beginning. Myself and John Keville cut our teeth and gained our experience on the same short films, and it’s been amazing to watch himself and Conor Barry turn themselves into the force they are today. IFTN: Seána Kerlsake is another great addition to the team and probably one of the most talented young women working on screen in Ireland today. What was your casting process like and how did you come to choose her? “I was living abroad for a short spell when ‘A Date for Mad Mary’ landed, so I missed it first time out, but heard so many great things about Seána’s performance. When the idea of Seána was brought to me, I sat down and watched all of her work. It was really really clear to me that she was perfect for the role of Sarah, because she challenged my initial assumptions of what the character would be like. IFTN: Can you tell us a little about the locations you have chosen for ‘The Hole in the Ground’ and when we can expect to hear it shooting? IFTN: Finally the support from the Irish Film Board and Bankside Films has been incredibly positive. If you had to advise emerging filmmakers on the best ways to develop their skill set and earn the support of major players and talent, what would you say? “The Irish Film Board have been incredibly supportive. Development is a dark and dangerous road and sometimes you slip off it and land in the ditch, but the IFB have always been there to offer a hand back up and afford me the opportunity to keep pushing forwards. I really hope I can deliver a film that repays their faith. I’m so pleased Bankside have come aboard so early on the film. I first met with Steven Kelliher years ago in Galway when myself and John had made our first short together and he said he hoped to work with us some day. He’s proven to be a man of his word.